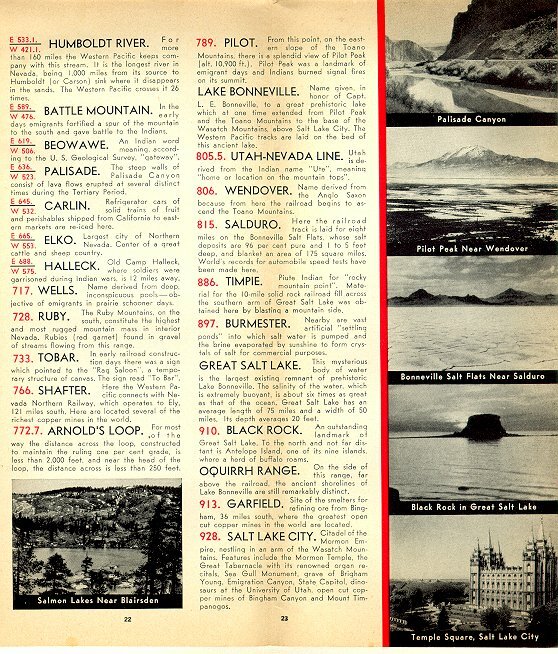 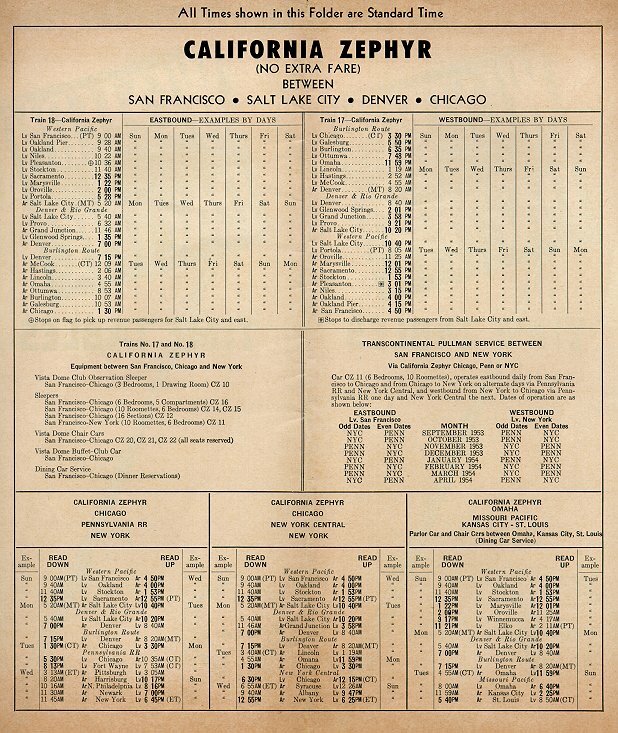 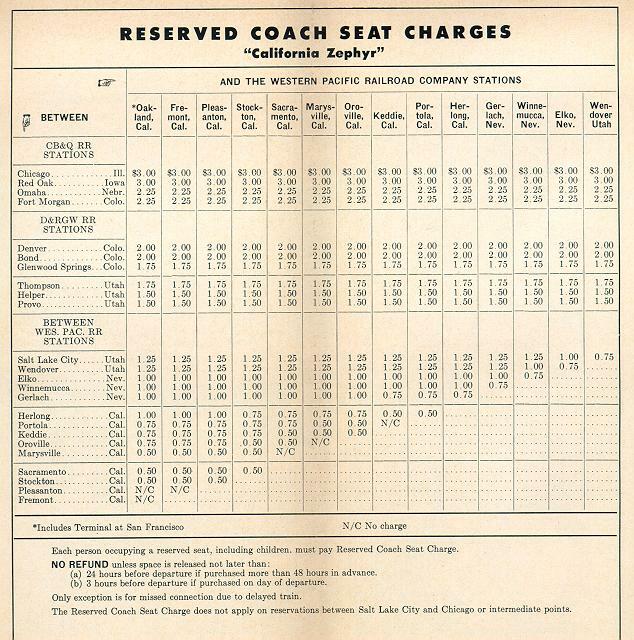 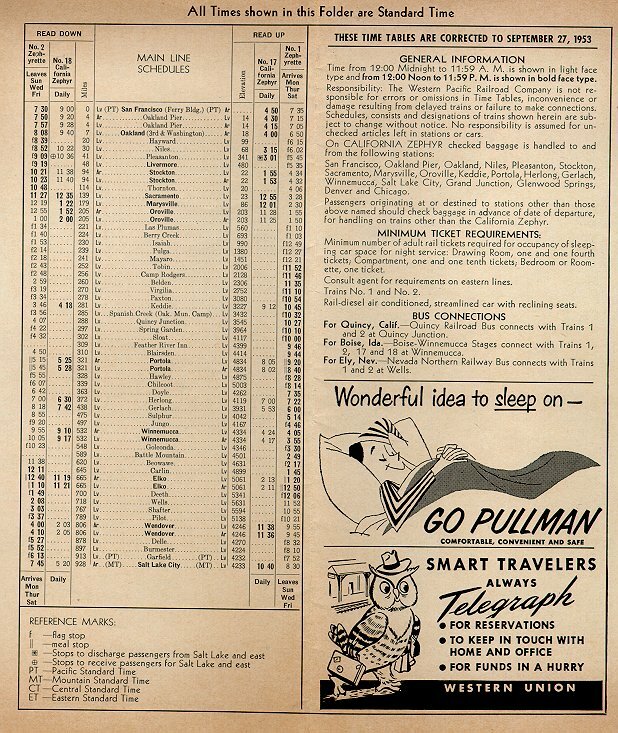 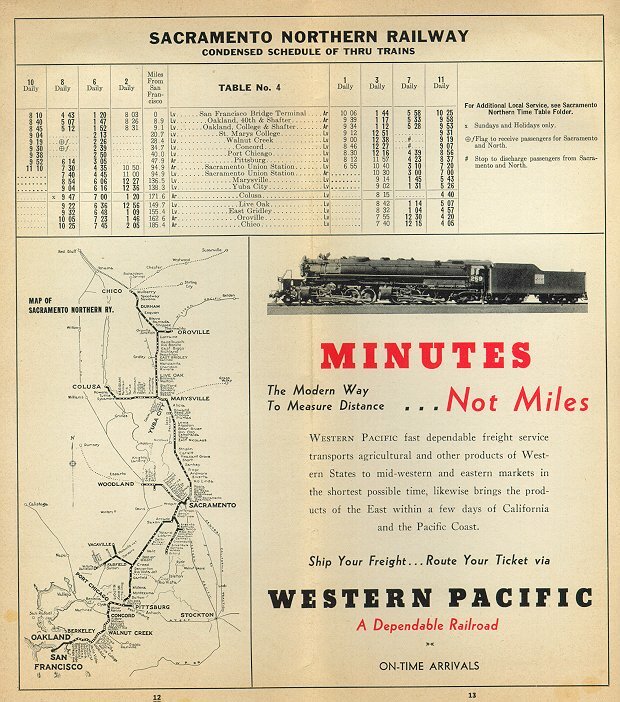 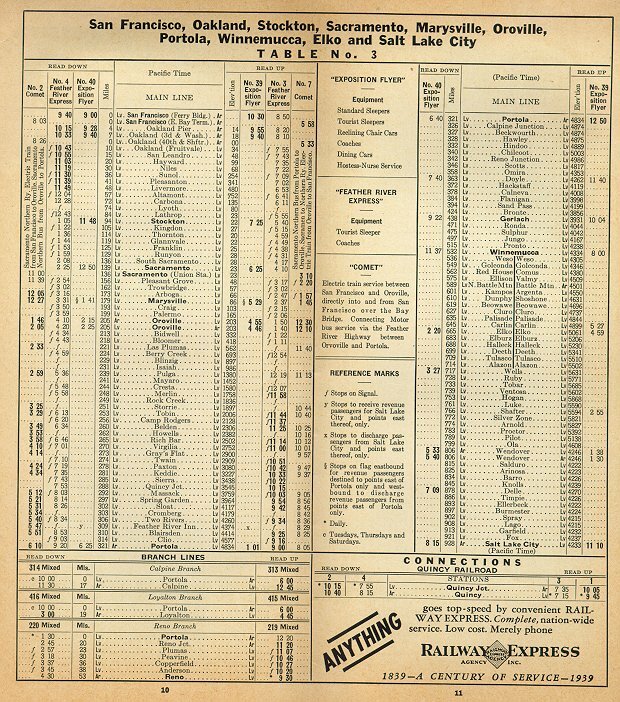 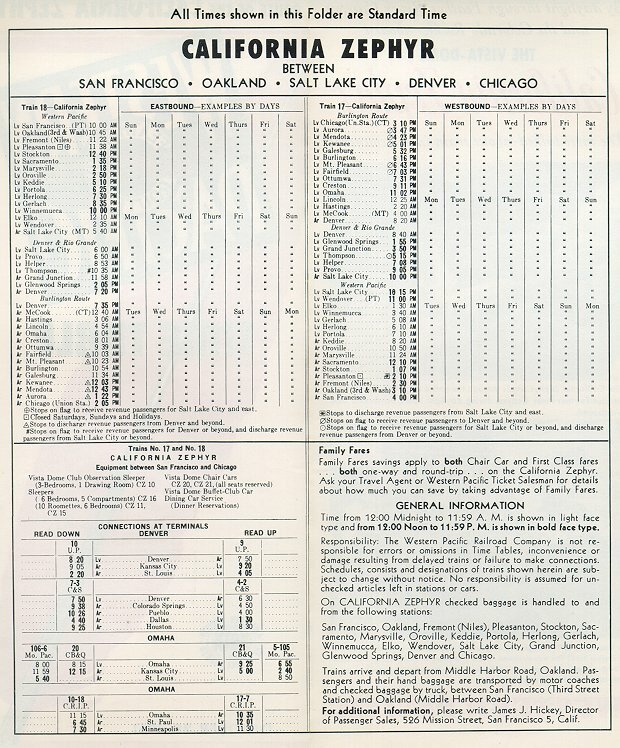 Note: Some of these timetables are also displayed on the California Zephyr Virtual Museum. 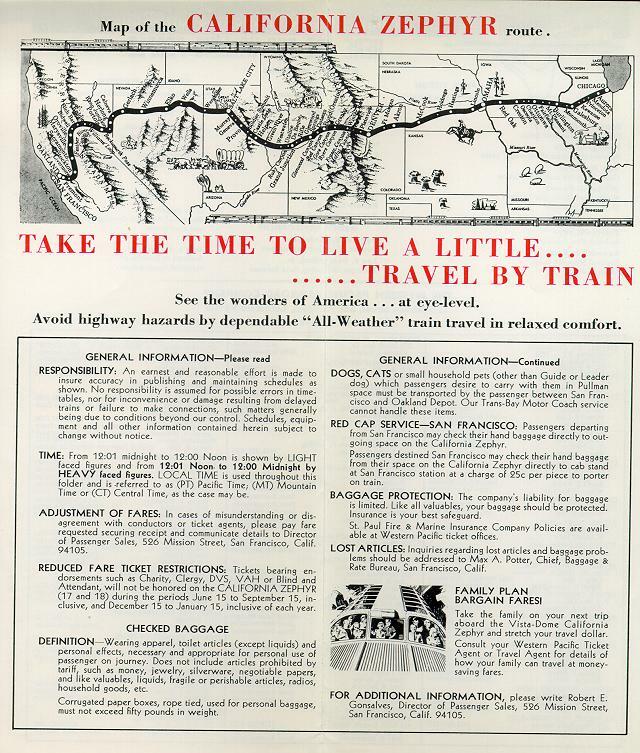 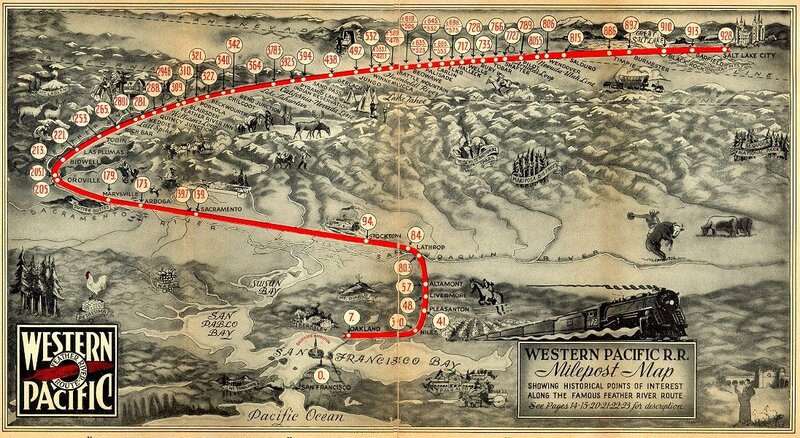 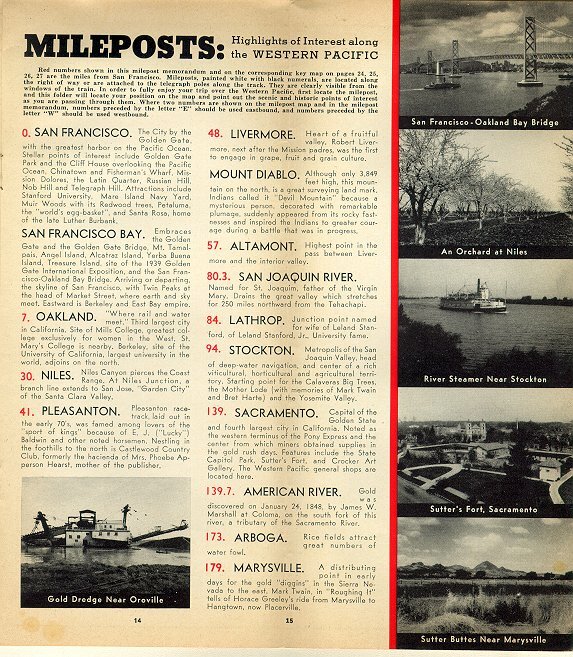 1939 Milepost Memorandum -- This publication is part timetable, part guidebook, listing sights along the WP's portion of the Exposition Flyer's route. 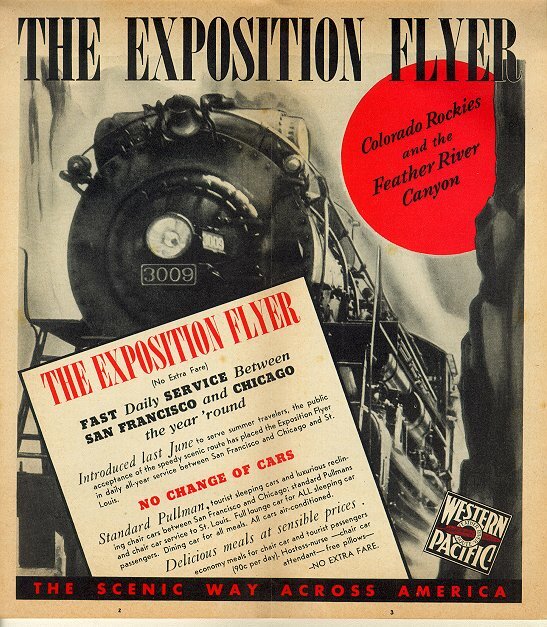 Expo Flyer Advertisement Locomotive is not WP's, however. 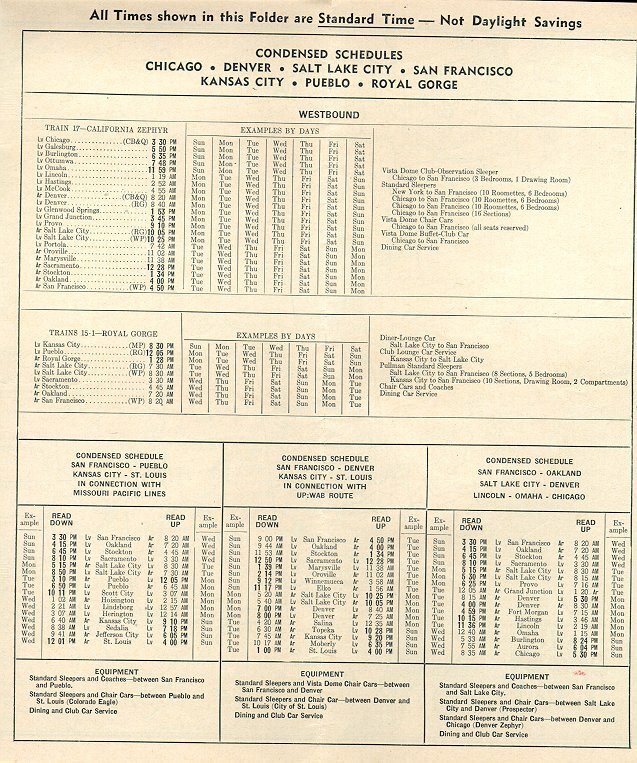 1947 Exposition Flyer Timetable -- Corrected to July 6, 1947. 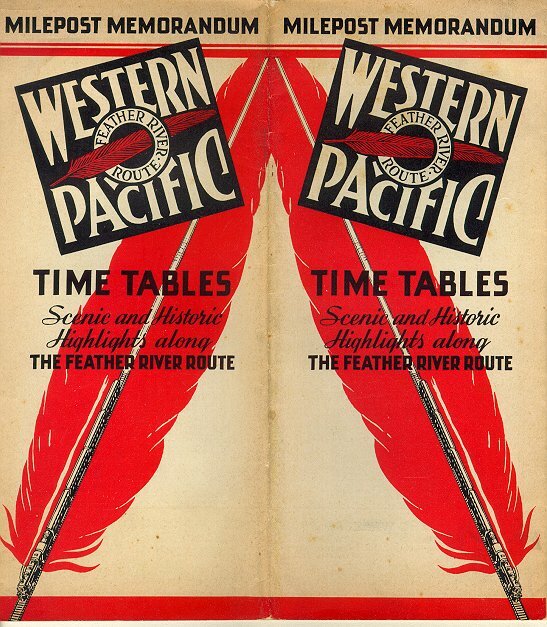 Single sheet, folded in half. 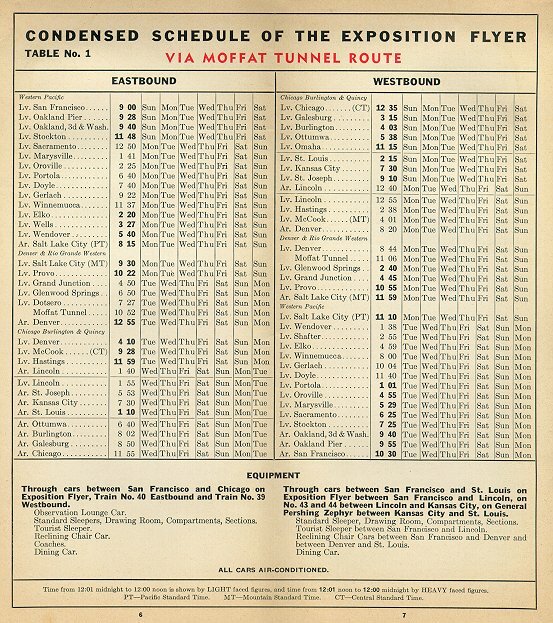 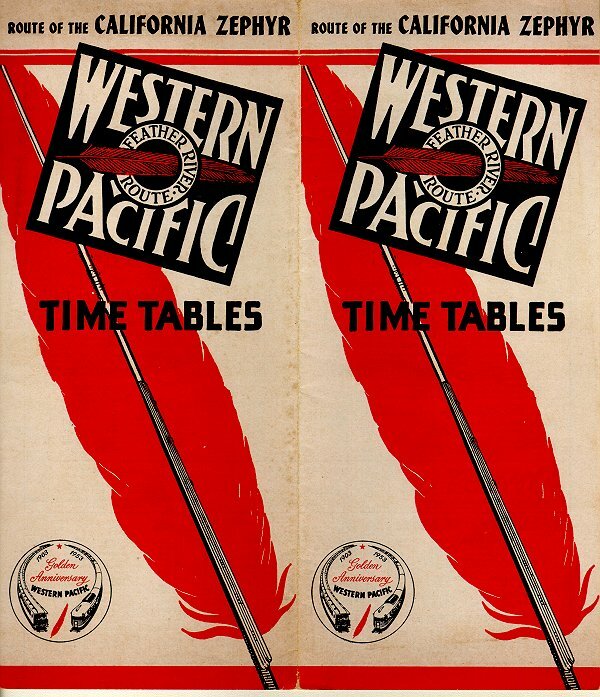 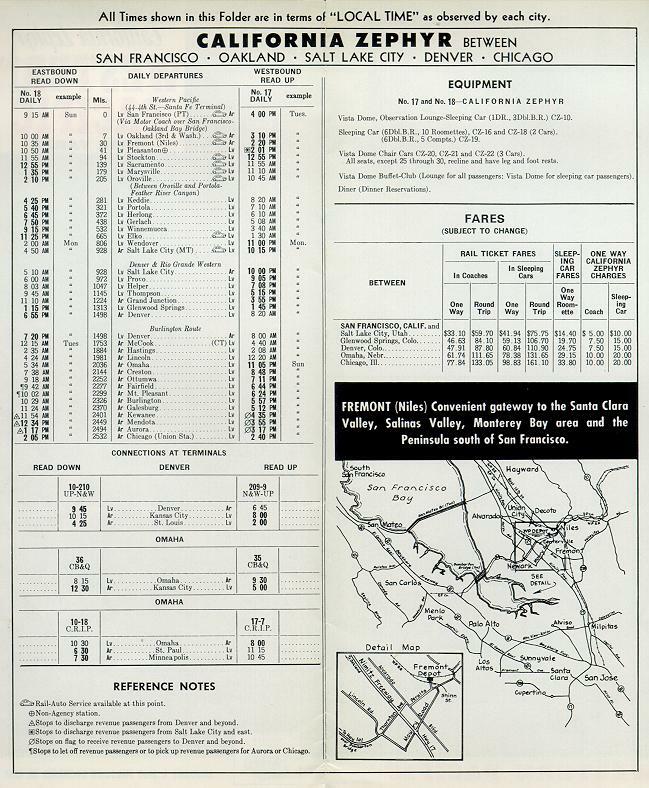 Interior view of the schedules...along with the schedules for trains 39 and 40 (the Flyer), it includes the schedule for trains 1 and 2, the Feather River Express. 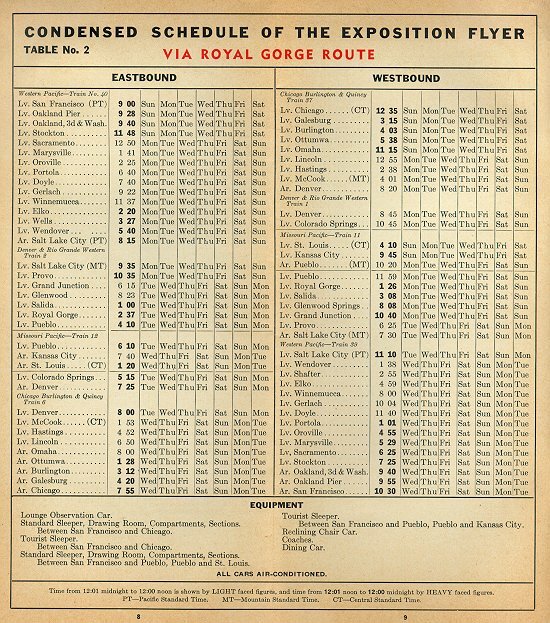 The express was later replaced with the Royal Gorge, which was then replaced with the Budd RDC-2 Zephyrette. 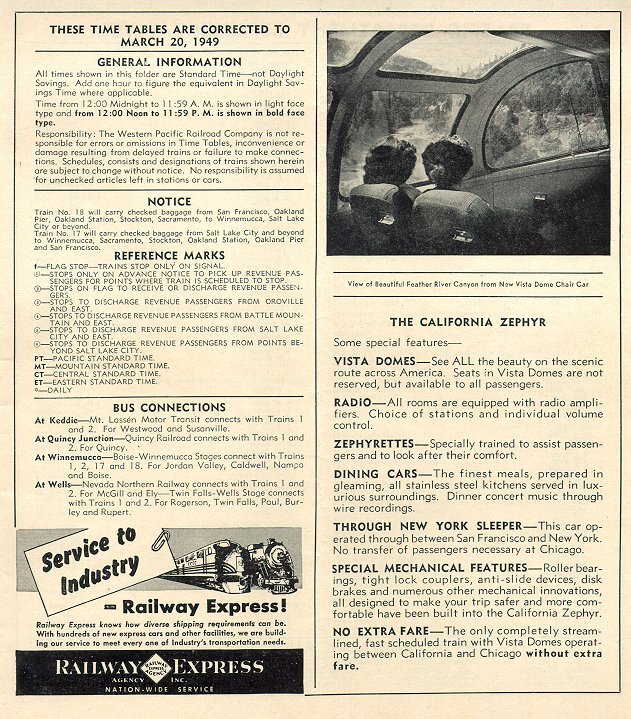 1949 California Zephyr -- Corrected to March 20, 1949. 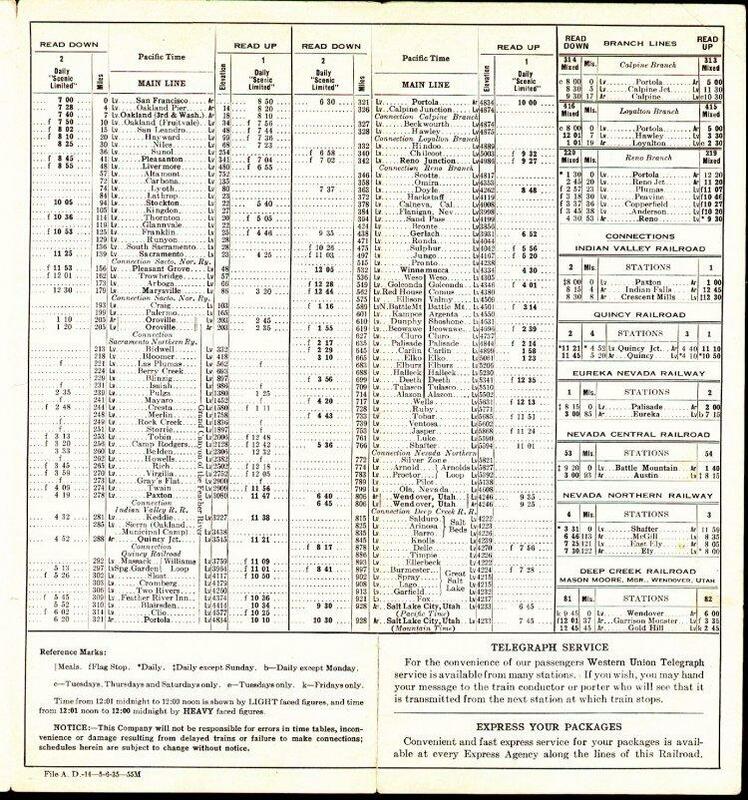 Issued on Inauguration Day, this timetable is surprisingly bland, with no big ads for the train, or any hoopla at all. 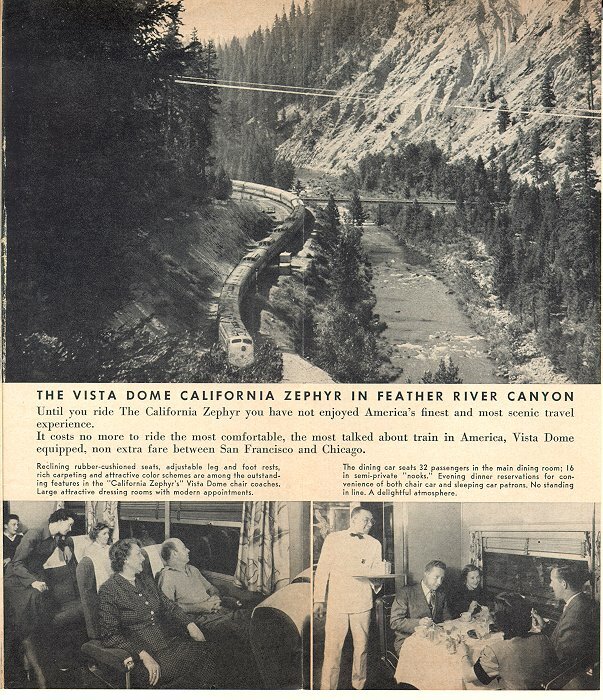 Just one small promo photo from inside the dome car. 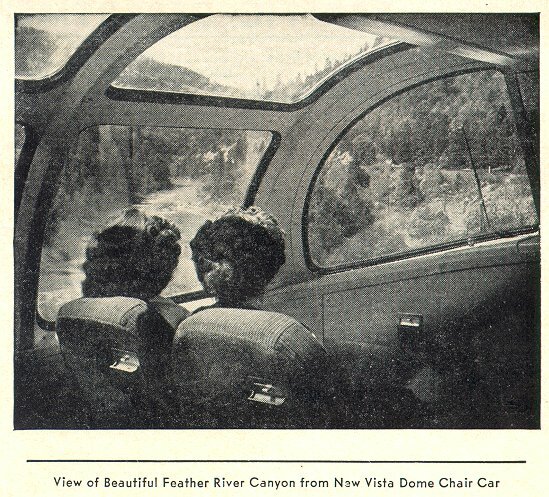 However, this photo is a bit significant, in that it shows windshield wipers on the dome's front windows. 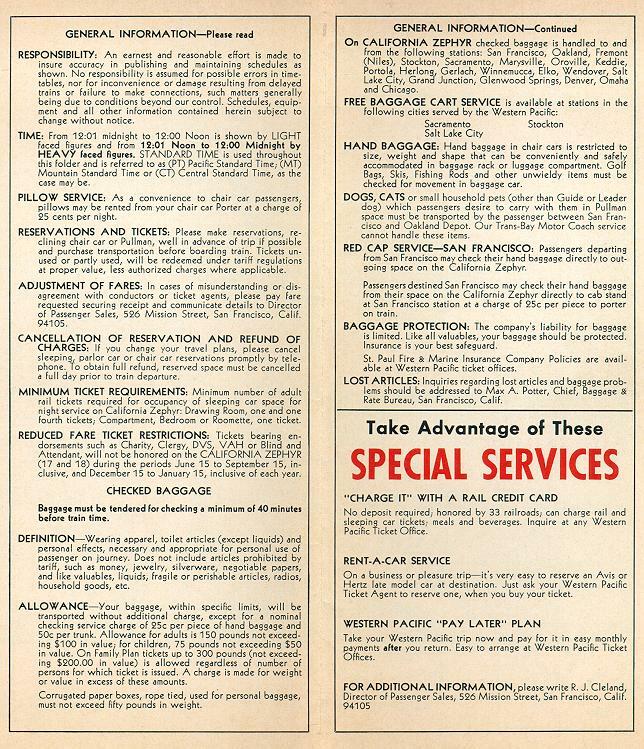 These were removed very soon after the beginning of service. 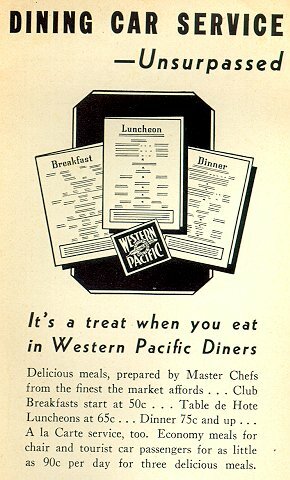 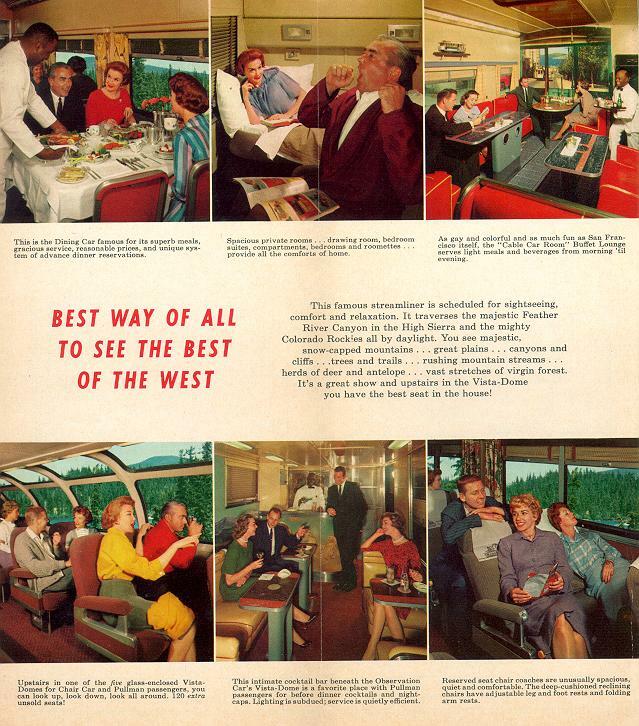 1953 California Zephyr -- Corrected to September 27, 1953. 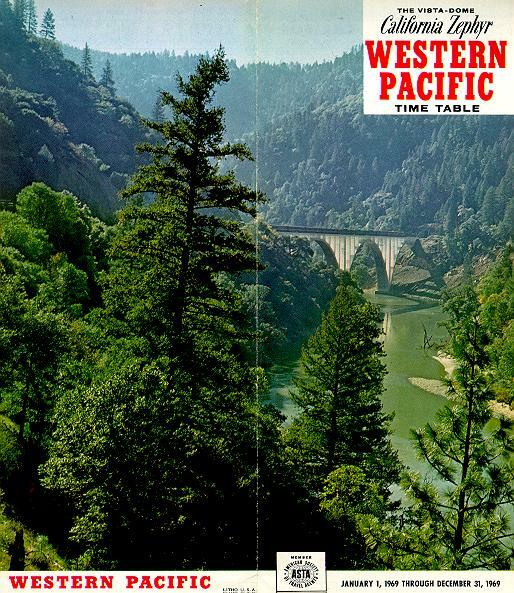 Two sheets, folded twice. 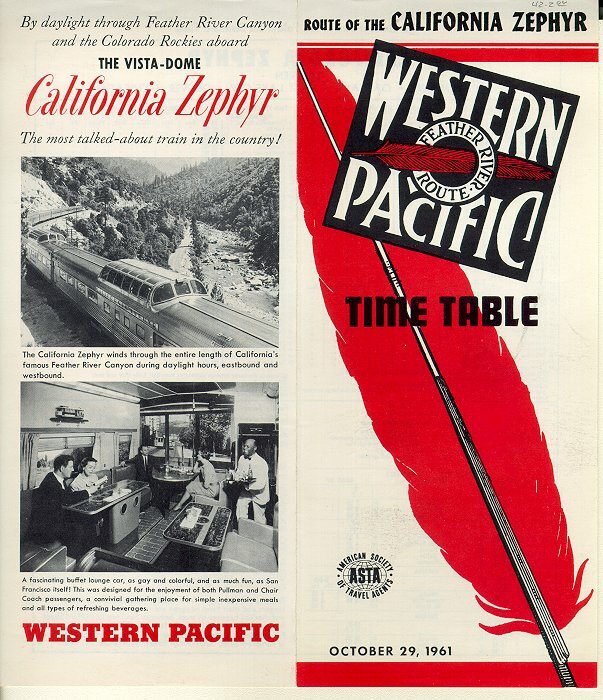 Note that the quill of the feather has a streamliner, as opposed to the steam train on the Exposition Flyer time table above. 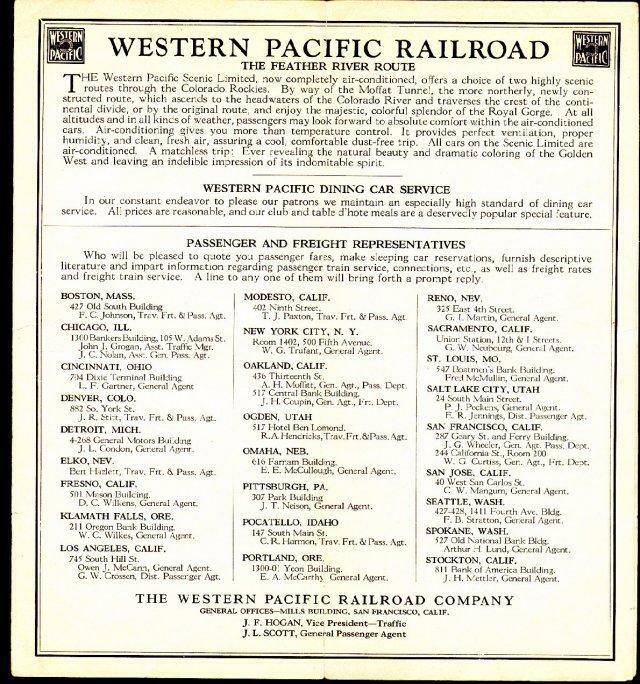 Also note the WP's 1953 anniversary logo. 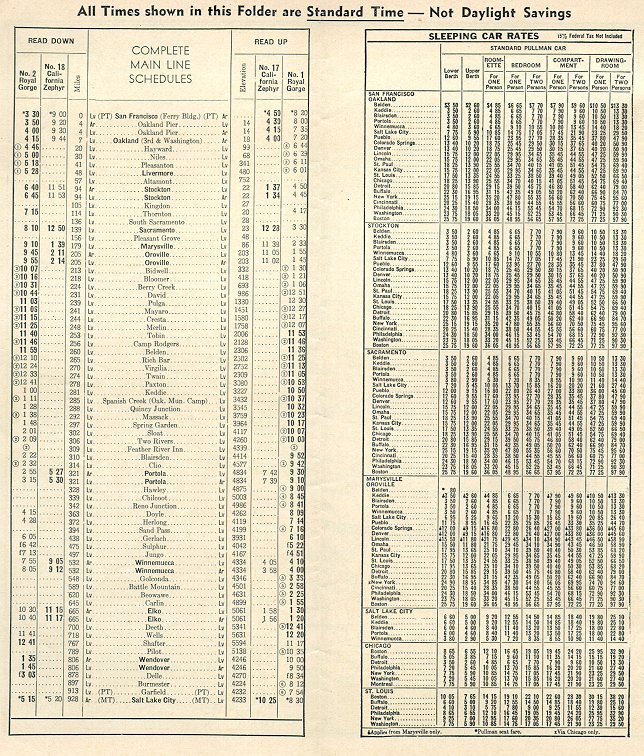 Condensed schedule for the entire CZ route. 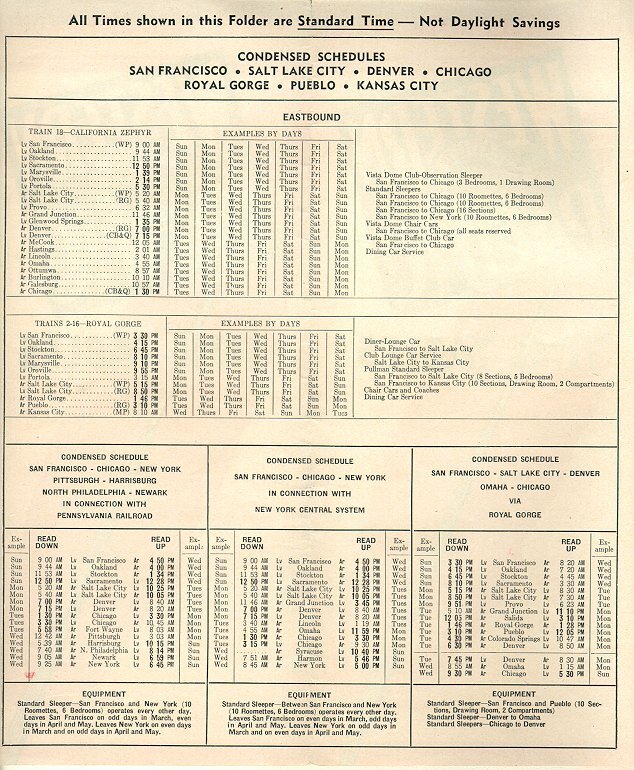 Includes extensions to New York City via both the PRR and the New York Central, and to St. Louis via the Missouri Pacific. 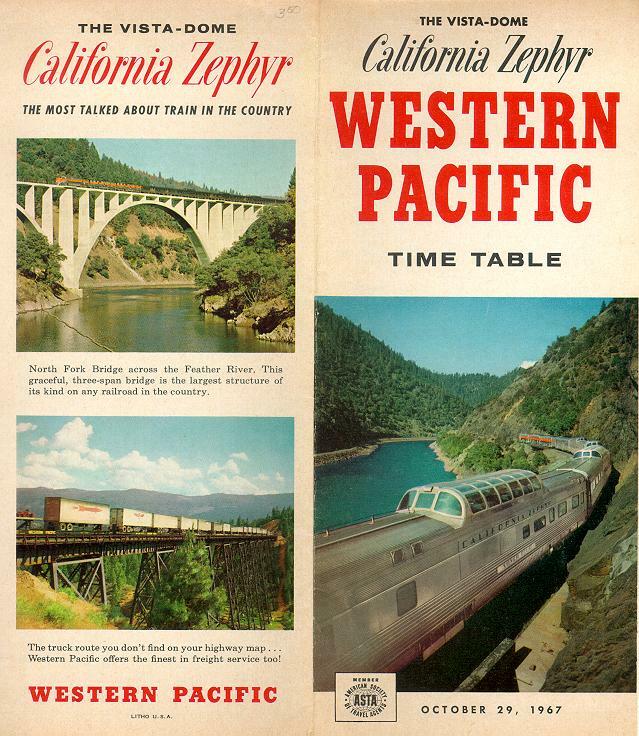 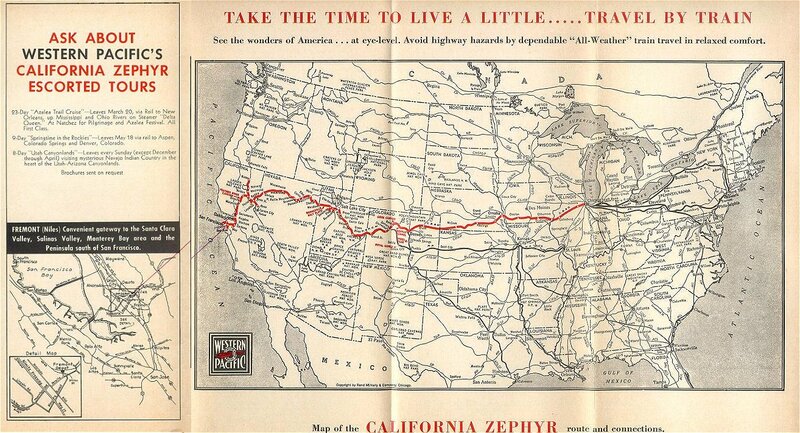 1961 California Zephyr Single sheet, folded once. 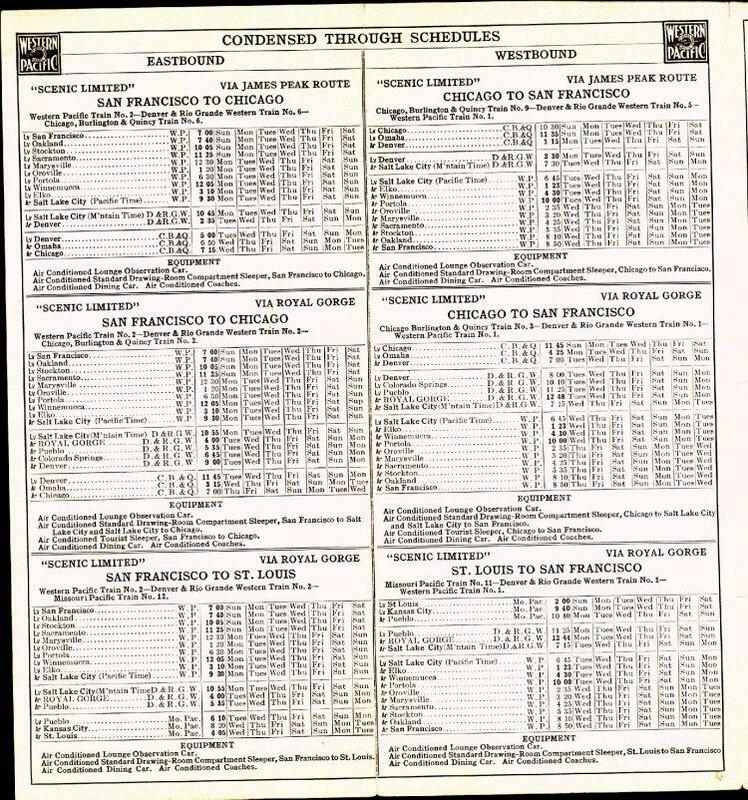 Condensed schedule inside. 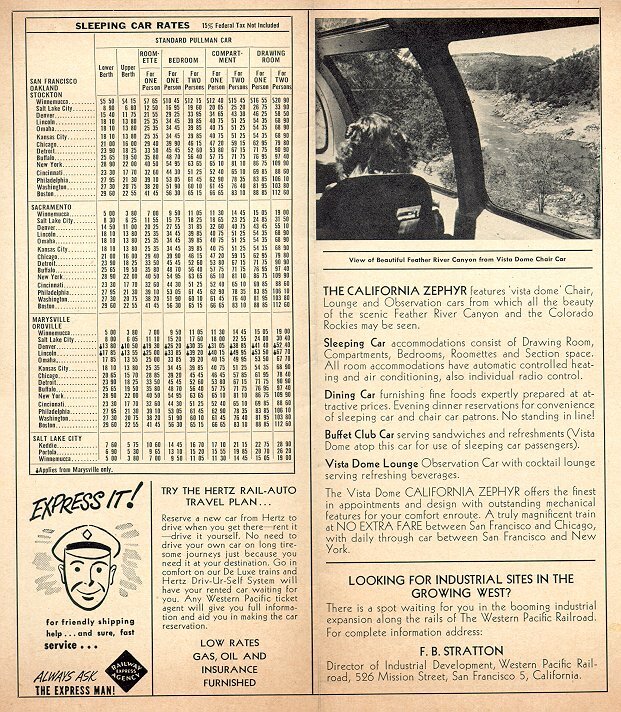 1967 California Zephyr -- October 29, 1967. 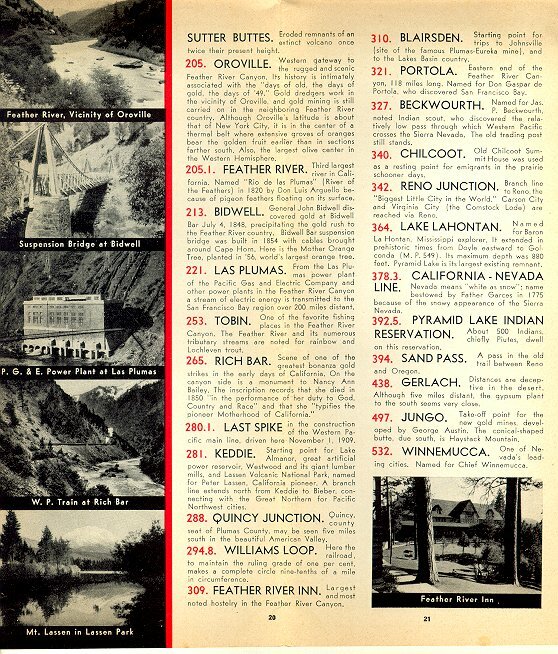 Two sheets, folded twice. 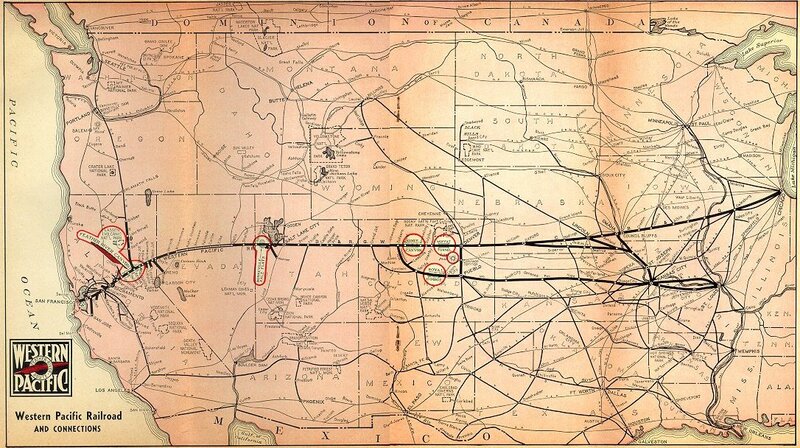 Center has route maps. 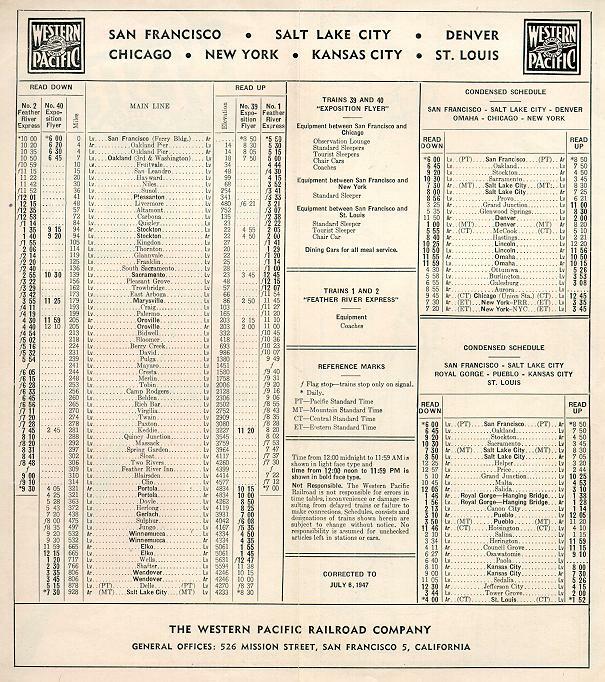 Includes connections to Kansas City (CB&Q) and Minneapolis (CRIP) and St. Louis, via the "UP/N&W"... 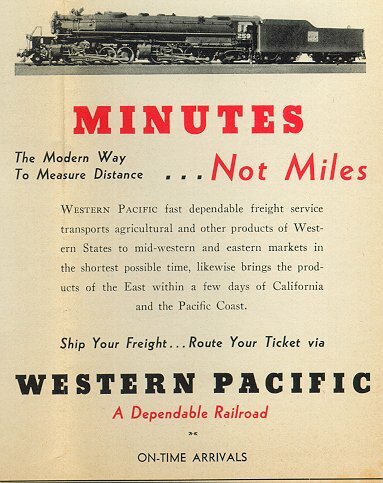 I had originally thought (and stated here) that this might have been a mis-print and that "C&NW" was actually meant, but Bruce Perry wrote that "N&W is correct, the line being the ex-Wabash which the N&W had acquired by that time." 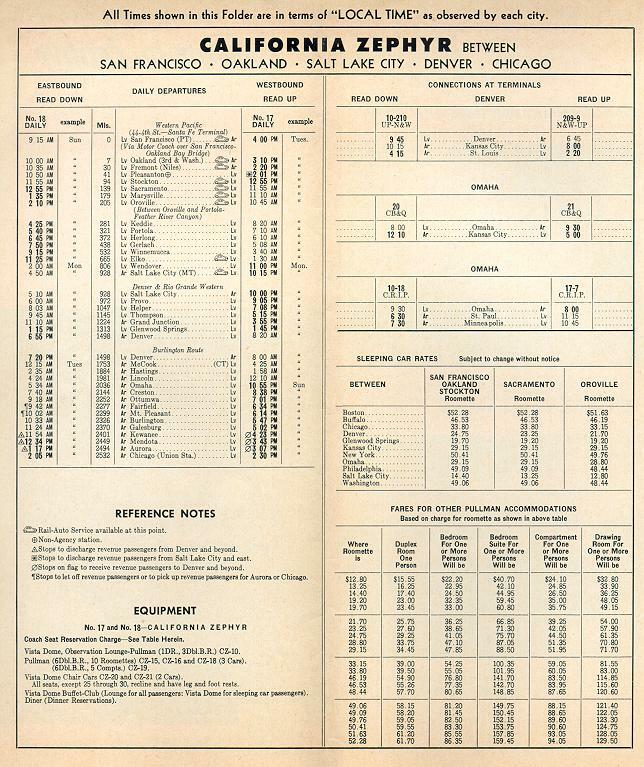 1969 California Zephyr -- January 1 through December 31, 1969. 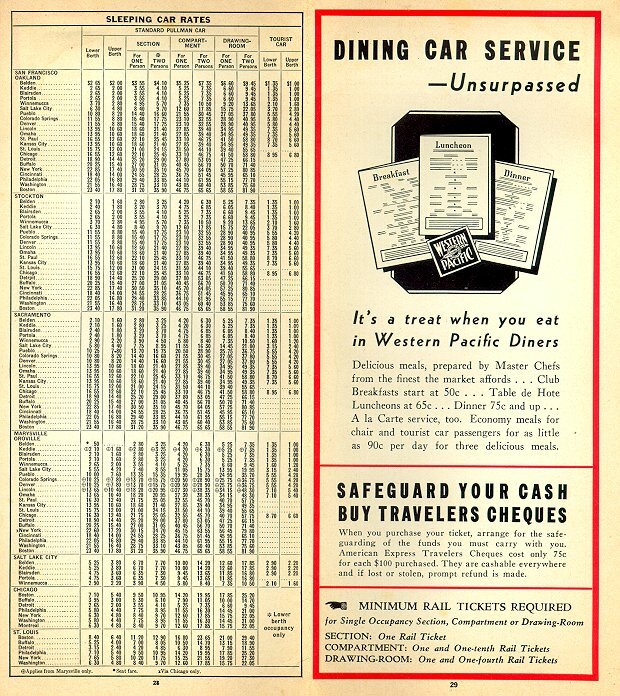 Single sheet folded twice.